The poker scene in Illinois is hit or miss. Much of it is still a grey area, with specific concerns like social gambling not being specifically addressed. That said, there are worse states for poker players to live in. Illinois residents still have options for real money poker, and the future looks relatively bright for real money online poker to be legalized. 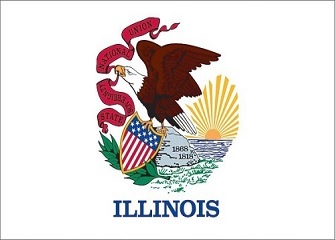 Online poker is specifically mentioned in Illinois' laws. However, it's only in regards to operating an online poker site. It doesn't mention anything about playing at one. Despite not mentioning playing online poker games, one could assume that that's made illegal by this statute. So even though it's possible to sign-up and play at online poker sites, that shouldn't lead you to assume that it's ok. It's definitely more illegal than legal. There aren't any laws specifically addressing home games or social gaming either. This is what I meant above by a grey area. You would think that it's not such a big deal so long as the organizer / operator of the game isn't taking a fee, rake, donation, etc. But that's not necessarily the case. Sec. 28‑3. Keeping a Gambling Place. A"gambling place" is any real estate, vehicle, boat or any other property whatsoever used for the purposes of gambling other than gambling conducted in the manner authorized by the Riverboat Gambling Act [230 ILCS 10/1 et seq.] or the Video Gaming Act [230 ICLS 40/1 et seq] . Any person who knowingly permits any premises or property owned or occupied by him or under his control to be used as a gambling place commits a Class A misdemeanor. Each subsequent offense is a Class 4 felony. Even if you did find a legal loophole to running your own home game, would you want to knowing that it can lead to misdemeanors and felonies? In February of 2012, a group of players found out the hard way. Police charged into their residence with guns drawn. The police proceeded to handcuff everyone and confiscate $3,000 in cash, chips and tables. However, only the operators of the game were charged. Everyone else was told they could go. So even if home games are ok for the participants, I don't think I'd want to be there. Not if the police are going to knock the doors down with guns drawn, with there being the possibility of me losing whatever cash I had on me at the time. Long story short -- I don't think I would mess with home poker games in Illinois. Do Casinos in Illinois Offer Poker? You can play table games such as craps, blackjack and roulette, as well as poker, at a number of land-based and riverboat casinos including The Hollywood Casino and Empress Riverboat. We receive a lot of questions regarding gambling and online poker in Illinois. We thought it would be helpful to everyone if we posted those questions and our answers here. Will Illinois see regulated real money online poker? Maybe. On one hand Illinois has already made it illegal for someone to operate an online gambling operation within the state. On the other hand they've made it legal to purchase lottery tickets over the internet. So you have to assume they see the potential in offering intrastate poker, especially after watching states like Nevada jump in. Here is a timeline of online gambling legislation / regulation in Illinois for the last several months. We'll update this as new information is released. Amongst other things, the introduced bill would permit online wagering. Not just poker though, but all forms of gambling. The governor has a difficult time deciding which way to learn, stating that online gambling is too new, and as a result, should not hastily be put into a bill. Conflict between gaming board member Aaron Jaffe and Senator Terry Link causes concern as to whether or not it will affect the new gambling bill to move forward. The legislation regarding online gaming has been stripped from the bill. However, the State Senate President promised to reintroduce the gambling provision as it's own bill. They have no idea when that might happen, though. Is there an online poker room that accepts players from Illinois? Yes. Despite online poker being illegal in Illinois (more than likely), poker sites are still accepting US customers from there, even though they’re not accepting US customers from other states against online gambling. Illinois residents can choose from several poker sites including Bovada, Sportsbetting Poker and Americas Cardroom, just to name a few. What other forms of regulated gambling is offered in Illinois? Illinois offers a lottery, charitable gambling and off-track wagering. Charitable gaming events can include games like pull tabs, craps, big six, gin rummy, roulette and blackjack. Where can I read more about Illinois poker laws? Here are some interesting facts about gambling and poker in Illinois. Casino gambling can only be performed on riverboats. All waterways in the state can be used for riverboat gambling except for Lake Michigan. Riverboat is a loosely used term. When the law was first created it meant offshore gambling. Now the only requirement is that the casino needs to be held on a boat, regardless of where it's at. Famous pro and entrepreneur Tyler Caby graduated from the University of Illinois with a degree in accounting. He later went on to create the poker training site, Cardrunners.